Bryan Sirchio Newsletter--New CD Release! My new CD "Fully Alive" is available as of today, May 7!!! Click Here to Buy "Fully Alve"
I've been working on this project for close to 3 years, so you can imagine how fantastic it feels to be able to type those words above and to make this new colleciton of songs available for purchase! I'm really happy with how these songs turned out, and I can't wait to see what you think. As is the case with all of my albums, this is a diverse collection both musically and lyrically. There are several gentle and encouraging songs such on the record such as "I Am Welcome"(the full version of this song including the verses) and "In God's Hands" (the song I wrote for my mother when she was terminally ill). But there are challenging songs woven in as well--songs such as "The Speech That God Martin Luther King Jr. Killed" (featuring excerpts from his 1967 speech at Riverside Church in New York City), and "Jesus Was Not An American" (which reminds us, as sensitively as I possibly can, that "the love of Christ crosses all borders and boundary lines"). Here are the titles of all 16 tracks on "Fully Alive." I know some of you have been waiting a long time for me to record certain songs, so I hope your favorite(s) made the cut! If you are enthusiastic about my music and about this new release in particular, please help me get the word out about this new recording by posting comments on Facebook and other social media. And if you'd like to go even further, please email me and let me know that you'd be willing to be a part of a social media team I'm putting together to help promote my music in a more organized way. That really just means being willing to post comments about my music on other pages, to share my blog, etc. So if you love social media and would enjoy helping me out in this way, please let me know. Wherever Love Is Children's Book Selling Well!! This new book for kids which I co-wrote with Sherry Favre is selling like hot cakes! 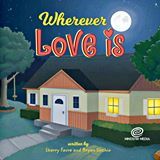 It's based on the story behind my children's song, "Wherever Love Is." This is a heart warming "good night book" and it makes a fantastic gift for parents with young children, for grandparents, for baptisms, birth of new children, etc. Thanks to all of you who have already purchased it. Again, if you enjoy it please help me get the word out about it! Thanks for reading this letter, for all your support over the years, and I hope to see you at a concert, worship service, or some other live event soon!